Just weeks after Republicans won control of the House in 2010, John A. Boehner celebrated his 61st birthday with a cake with green frosting. It was actually a double celebration. That same day, Nov. 17, 2010, he was elected speaker-designate by the Republican conference with unanimous support — a present he never enjoyed again. That unified Republican vote included at least seven current members of the House Freedom Caucus . Off Capitol Hill, where tea party activists had been rallying conservative voters to the polls weeks earlier, support for Boehner’s speakership was tepid. 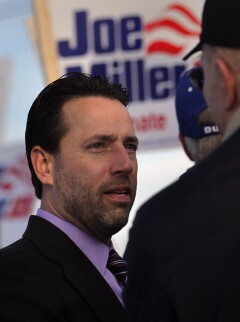 "We were willing to give him the benefit of the doubt at first," Joe Miller, Alaska&apos;s 2010 GOP Senate nominee, told CQ Roll Call last week. After losing the general election to Sen. Lisa Murkowski, who waged a write-in campaign to win re-election, Miller continued his tea party activism, and he now hosts a daily talk radio show. "On the fundamentals, [Boehner] appeared to be right," Miller added. In fact, some tea party supporters found the Ohio Republican to be the best of the available options. “When John Boehner was elected speaker following the historic tea party wave of 2010, it was another major victory for the grass roots. We fought incredibly hard for Mr. Boehner to be the speaker, instead of the establishment Republicans’ big-spender, Rep. Pete Sessions," California tea party activist Christina Botteri told Breitbart News in September. Other tea party sympathizers just didn&apos;t know much about Boehner, House leadership or how the process worked in Washington. "I would have to say that because a lot of us had never been really active in GOP politics, we didn’t have an opinion back in 2010," Randy Bishop, a Michigan-based host on Patriot Voice Radio, told CQ Roll Call. Fast-forward to this fall. Conservative blogs have claimed victory over Boehner&apos;s resignation. "Conservatives Inside and Outside the House Caused Boehner&apos;s Downfall," blared a Breitbart headline the day Boehner announced his resignation. "As [tea party activists] became more engaged in the political process, and knowing more of what&apos;s going on in Washington, obviously we started becoming very upset with Boehner," Bishop explained. Miller said Boehner&apos;s rhetoric was fine at the beginning, "but his rhetoric did not match his actions." "Although as a person and as a political figure he has not changed, his political philosophy — attitudes about him have changed, " Miller said, "and that’s largely the perception that he’s a compromiser." Wisconsin Rep. Paul D. Ryan, who officially joined the speaker&apos;s race on Oct. 22 , is being dogged by the same perception. Before his name came up for speaker, Ryan, even more so than Boehner in 2010, had his admirers on the tea party right. Former vice presidential nominee Sarah Palin was an early supporter of Ryan&apos;s budget plan , even suggesting that he&apos;d make a good presidential candidate. Leading up to the GOP presidential convention, the tea party had been expecting to be left out in the cold — until Mitt Romney added Ryan to his ticket. “The Ryan pick gives the tea party a seat at the table, and that’s why I’m so encouraged,” tea party supporter Allan Olson the Christian Science Monitor in 2012. Based on surveys of its supporters, the Tea Party Express called the Wisconsin Republican a "strong tea party choice" after Romney picked him for his No. 2. "We have been polling our members for the last couple of months, and Paul Ryan, along with Senator Marco Rubio, have had the strongest support from Tea Party Express supporters across the country," then-Tea Party Express Chairwoman Amy Kremer wrote in a statement at the time. "Ryan is a strong fiscal conservative, and he has used his Chairmanship of the House Budget Committee to address the serious financial woes facing the country," Kremer continued. Miller admired Ryan&apos;s economic views and his willingness to take on Social Security. "I certainly considered him an ally before — and he has done some good things," Miller said. Even Bishop, the talk radio show host from Michigan, was comfortable with Ryan back in 2012. "When Romney picked Ryan in 2012 as his vice president, we were willing to vote for anybody but Obama," Bishop said, admitting that he has a Romney-Ryan T-shirt in his closet. Not that he&apos;d be caught dead in it now. "Paul Ryan is a &apos;Mini-Me&apos; of John Boehner," Bishop said. Other right-wing activists and political commentators shared that sentiment this week. Ryan is "Boehner 2.0," Laura Ingraham tweeted on Oct. 20. Writing in Breitbart on Oct. 21 , Neil Munro highlighted the areas where conservatives fear that Ryan would fall more in line with the Republican establishment and Democrats. “But if he gets the job, he’ll likely push for goals that are very unpopular in the GOP’s base — passage of a trans-Pacific free trade treaty, a rollback of stiff jail sentences and a bill to increase the inflow of wage-cutting foreign labor. All three goals are top priorities for the Democratic Party and the GOP’s big donors,” Munro wrote. Palin soured on Ryan as early as 2014, calling his budget a "joke" on her Facebook page . Meanwhile, her fellow Alaskan Miller pointed to recent votes Ryan has taken in Congress to explain the tea party&apos;s disaffection with him these days. "He was always championed as being an up-and-coming bright star — articulate, smart and willing to address the hard issues," Miller said. His votes — most recently for a continuing resolution that funded Planned Parenthood — "badly tarnished him," Miller added, calling Ryan "a tool of the establishment." So what does the tea party grass roots want to see in leadership?